Does your heart start beating out of your chest at the mere mention of the word, “dentist”? Does the thought of actually sitting in a dental chair cause you to break out in a sweat and start gasping for air? Have you neglected your dental health for years because of this fear? With sedation dentistry there’s no need to be anxious about your dental procedure. Today’s dentistry has the perfect solution for you. Do you know that you can actually sleep through your next dental appointment, remembering nothing when you awaken? Sound too good to be true? Call Exquisite Smiles and let us explain sedation dentistry to you. After we do, we’re confident that you’ll schedule what might very well be a long overdue appointment and take sedation dentistry for a test drive. Sedation dentistry goes by several names – conscious sedation, sleep dentistry, relaxation dentistry or oral sedation – but the effect is the same. Your pain and anxiety are kept under control as you remain just below the level of consciousness during your dental procedure. Because you are thoroughly relaxed and comfortable, the doctor can perform procedures that might ordinarily take years to complete in only one or two visits! How Does Conscious Sedation Differ from General Anesthesia? When a patient is under general anesthesia, he or she is completely unconscious and unable to respond in any way. Conscious sedation, on the other hand, allows the patient to respond to questions or commands and to breathe normally, but he or she will have little or no memory of the procedure upon awakening. 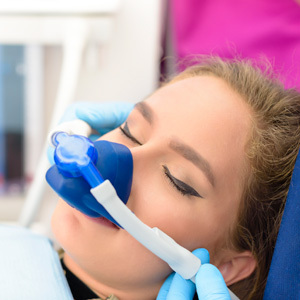 Inhalation Sedation – Nitrous oxide, also known as “laughing gas,” is delivered though a mask from which you breathe normally. It works quickly, blocking out all sensation of pain, with no side effects or “hangover” type symptoms after the procedure is completed. Oral Sedation – Delivered via pill form, this is usually taken at bedtime the night before the dental procedure and again one hour before the set appointment time. This form of sedation produces a drowsy, calming effect that greatly reduces anxiety. IV Sedation – Delivered via the bloodstream, this form of sedation acts quickly to place you in a totally relaxed state and causes partial to full memory loss (amnesia), so there is little, if any, memory of the procedure. During your dental treatment, we constantly monitor your vital signs to make sure everything is normal. The doctor has been carefully trained in sedation dentistry, so there is no need for any additional worry! Many dentists around the world now use sedation dentistry because it is considered to be so safe. Sedation dentistry allows Exquisite Smiles to offer you the optimal environment to complete multiple treatments in only one or two appointments. You remain calm and relaxed while we do all the work to improve your smile!